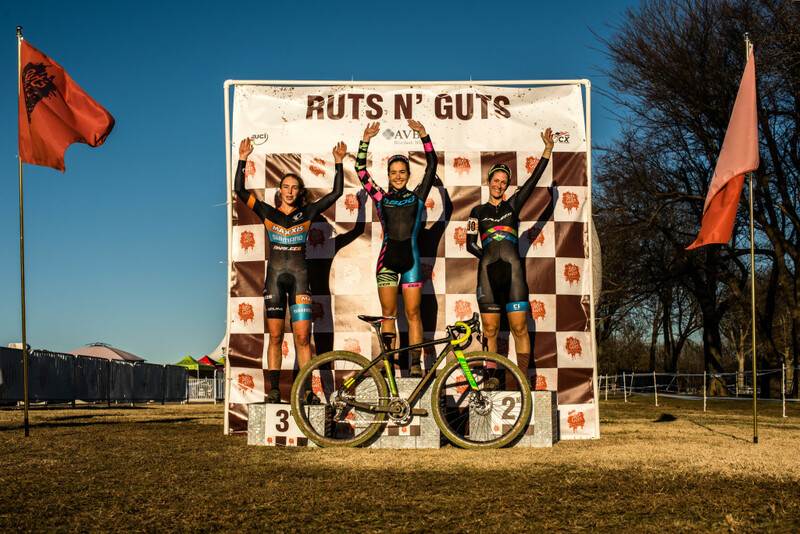 No matter what happens with the rest of my cycling endeavors, I’ll always have this memory of not only my first win, but back-to-back UCI wins at the first UCI-sanctioned Ruts ‘N Guts weekend. Believe me, it still feels like a dream. I’ve had the unique opportunity to share my reflections from each race weekend here at In The Crosshairs and it’s made me appreciate the journey more than ever this year. We left mid-day Wednesday and spent eleven hours on the road traversing California and Arizona. Thursday saw another eleven hours on the road across New Mexico and the tip of Texas until we arrived in Oklahoma City. 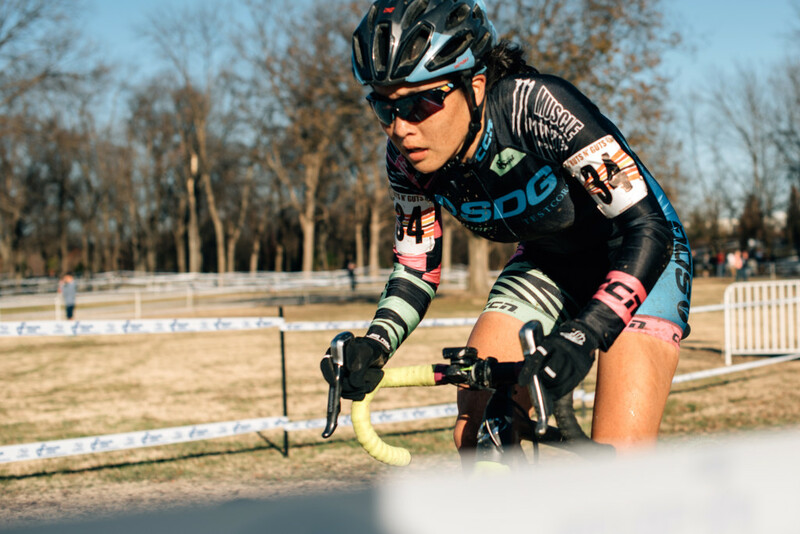 On Friday, the previous driving stretches allowed us to sleep in, get some work done, and casually make our way to Tulsa to check out the course. Tulsa, OK sits just about 200 miles south of Emporia, KS and I’d like to think some good luck vibes were drifting my way from the Midwest gravel I’ve come to love. Wake up. Follow the routine for the day. Stay focused. I had a fifth place call-up. Starting on the front row did great things for my motivation and I was excited to get this race underway. 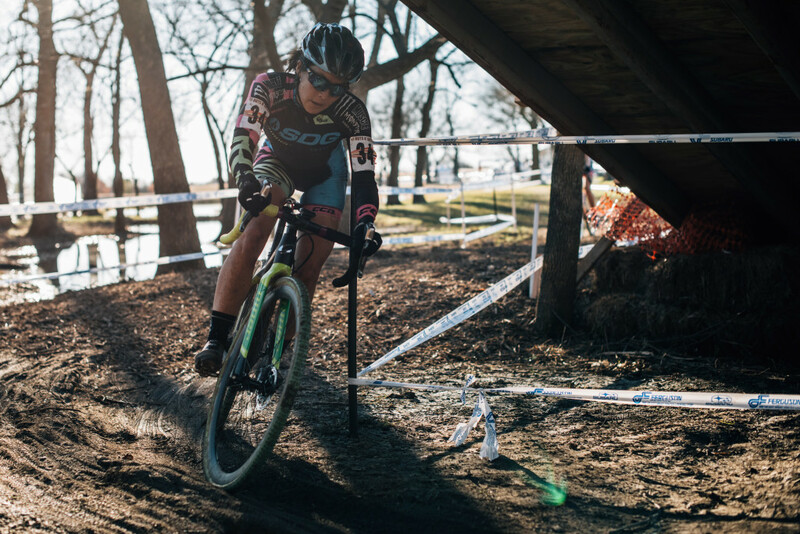 Meghan Korol (Team Handmade) shot off the line, Emily Kachorek (Squid Bikes) came by me on the pavement turn, and I was somewhere in the top six as we turned the corner into the first and longest sand pit. I should’ve committed to running it on the first lap. Instead I struggled to get off my bike a third of the way in and finally got going, still around sixth place. 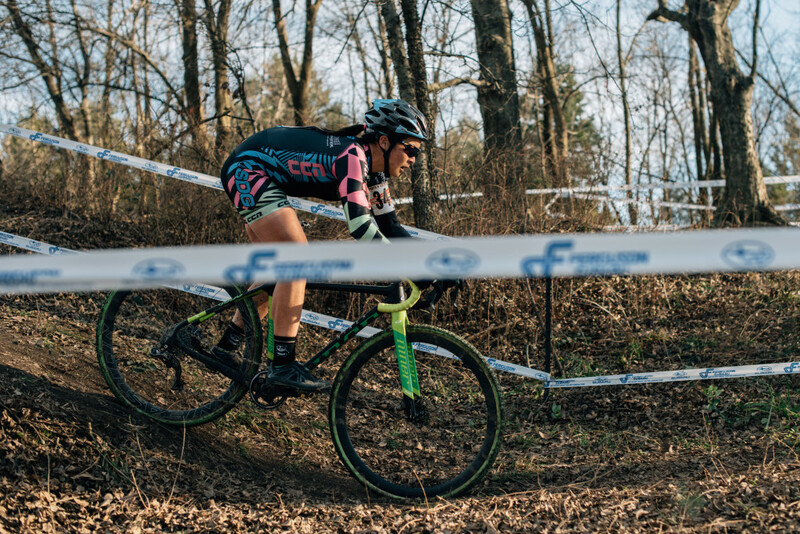 I wasted no time, passed four people on the long straightaway towards the trees and was sitting behind local favorite Christina Gokey-Smith (Dallas Bike Works). Gokey-Smith knows this course, having won both days in 2014. I was content to sit-in through the twisty trees and watch the lines. This is also where I noticed that Gokey-Smith and I were both riding the same BSB9RDO frame from Niner Bikes! As we exited the first downhill sand section, there’s a very long, slightly uphill straightaway back towards the pit. I decided to make a move and see what sort of gap I could make. I kept the rest of the lap strong and eventually came through with about 15 seconds on the chase group. I looked down at my Garmin and realized they were probably going to make us do four more laps based on the timing. In that instant I questioned my decision to attack on lap one but I was comfortable with the pressure of leading. 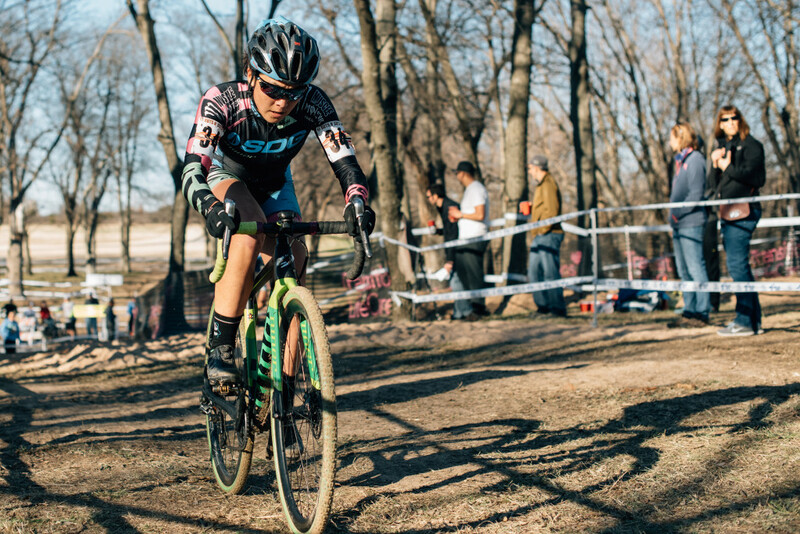 In every other UCI race I’ve ever done, I’m constantly chasing. It’s a continuous pursuit to move up and because of that I take more risks and neglect to ride my own race. 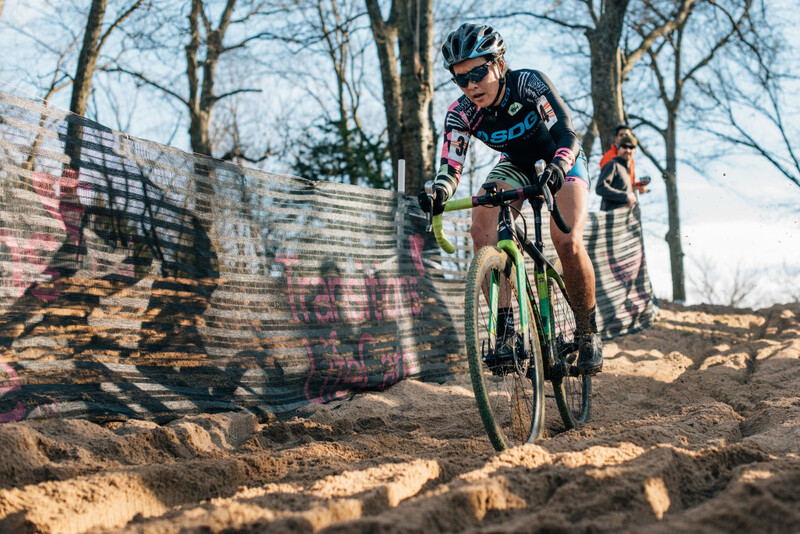 There’s a big difference between racing with the sole focus of pushing your way to the person ahead of you versus riding at your own personal best pace with the pressure coming from behind. I was confident with my line choices, rode the off-camber turns on the dam (coined “Tanner’s Torment”) with ease, and maintained my lead. I came down the flyover on lap three and a gentlemen on the side of the course politely yelled, “Ma’am, you’re killing it!” I cracked a smile around the next corner. The comment was too perfect and embodied the charm and hospitality of Oklahoma I felt all weekend. Thank you, sir. 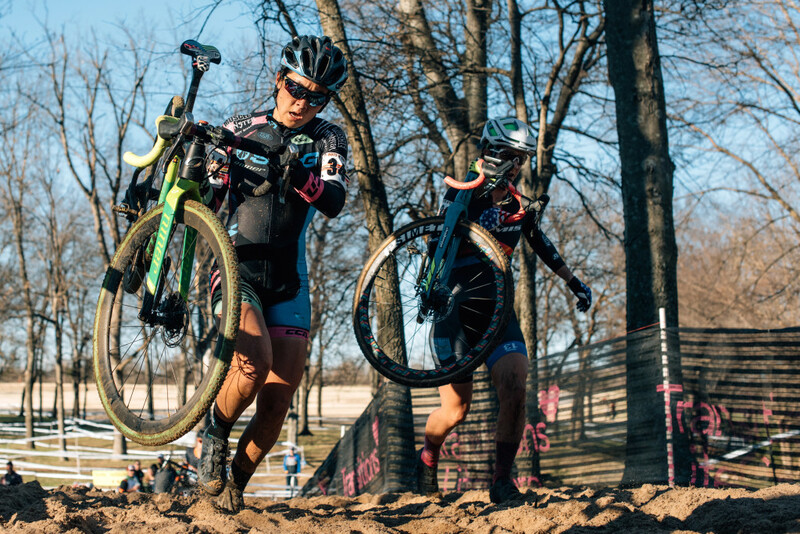 The race was taking place behind me while Kachorek, Jessica Cutler (Jamis Pro Cyclocross), and Erica Zaveta (Maxxis-Shimano Pro Cyclocross) were trading off in the battle for the podium spots. With two to go, Kachorek secured her way into second and was in hot pursuit. I felt the pressure and she certainly gained time on me in the second half of the race, keeping me on my toes. Zaveta followed up to secure third. Coming by the lake on my way to the finish line, I finally let myself relax and smiled as announcer Larry Longo began welcoming me in. Hearing the familiar voice of SoCal’s own Larry Longo announcing my name was the icing on the cake as I posted up for my first ever UCI win. Sharing the podium with Kachorek was even sweeter because we attested that California cyclocross is a force to be reckoned with. I felt the pressure all morning. There was a target on my back. I was prepared to fight and knew that the reverse course from Saturday was going to make for a very different race. Sunday’s rerouted start threw in a tricky curveball and I was at the back of the lead group coming out of the first sand section. Gokey-Smith took off and I moved up to lead the chase into the uphill off-camber of Tanner’s Torment. With the confidence of riding this section while warming up, I stupidly tried to ride it on lap one and slipped before the last turn. Kachorek was already running behind me and picked her bike up and over me while I was on the ground struggling to get back up. I kept yelling sorry knowing I caused a gap for everyone else by getting in the way. Needless to say, I ran Tanner’s Torment for the rest of the race because it was faster to run it than slowly try to ride it. Lesson learned. This hiccup got me flustered and I was now behind Kachorek as we tried to bridge the gap to Gokey-Smith. I rode a lower line into the railroad ties and when I went to dismount, my left shoe decided not to unclip and I launched forward onto my left side while stuck to my bike. I went down hard and it hit me with a big enough whiplash to snap me out of my recklessness. I got up and told myself to chill out. I was too anxious and was making stupid mistakes. For the next two laps I calmed down and paid more attention to the racers around me, watched their lines, took note of where they were struggling or being smooth, and played the game smarter. The large sand pit that was previously downhill in both directions was now slightly uphill and made for a new challenge. Spectators gathered to cheer us on and every lap through there I could smell the beer flowing. Their liquid courage and extra loud encouragement eventually inspired me to stay on my bike and ride the first uphill sand on lap three of five. The screaming Okies encouraged a few more watts out of my legs and I cleared the sand, totally surprising myself. In that instant I knew that spot would be a game changer on the last two laps. I won! Twice! I still can’t believe it. There have been good days and bad on the road to get here and everyone always talks about appreciating the good days even more once you’ve had a few bad ones sprinkled in there. Thanks for following along and being a part of the journey it took to get there. This one was for my sponsors, my parents, David Sheek, and everyone else who has believed in me. Thank you! Panda’s Tour of the Southern Cross Series is in full swing. 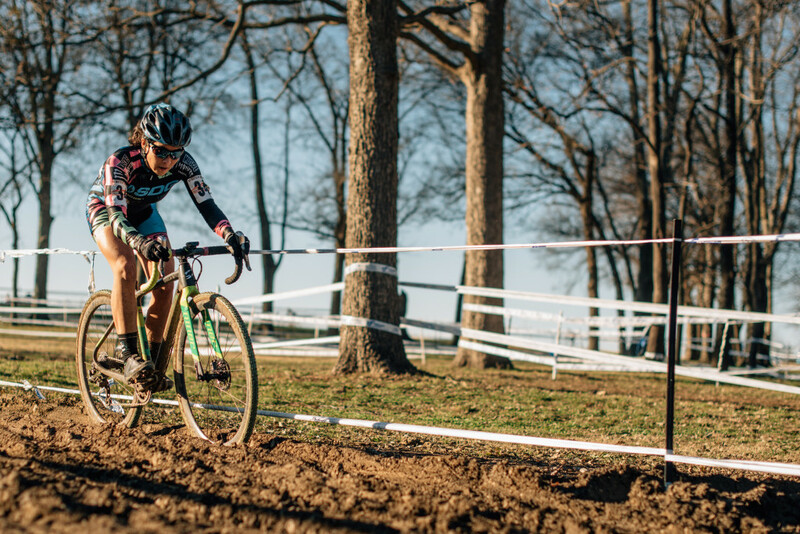 This weekend I’ll be racing in Dallas for Resolution ‘Cross where we saw muddy conditions just before Austin last season. Pending results and how the body feels I will move on to the races in Waco just before Christmas as well. I really like the cyclocross community down here and am so appreciative of the hospitality I’ve been treated to thus far. That was awesome!! I love the blow by blow account that Amanda gives, and it makes me proud that our race can bring such accomplishment to a rider who has trained hard! Great work Amanda! Congratulations!!! What a well written and exciting race account!!! This team did an incredible job on every aspect of this race. So, glad Oklahoma showed it’s hospitality…. And yes, that gentleman was right…. Ma’am your killing it!!! ??? Yep, you are killing it! Love the column, and great pics! Was fun to watch you killin it on Saturday at this event.